Welcome to our #MeetTheMaker special, Meet The Makers of The Handmade Fair. Every day for two weeks we will meet some of the fabulous creatives who will be attending this year's Kirstie Allsopp's 'The Handmade Fair'. The fair will run from 16th - 18th September 2016 at The Green (Hampton Court Palace). Don't forget to use your special Crafty Bs discount code when you are booking your tickets! You can also win yourself some tickets here. I have always been fascinated by the ability that some people have for translating beautiful life like designs onto paper with the use of pencils. Such a simple tool means that beautiful prints like this one, depend solely on talent of the creator. In this case, the artist is Hayley Louise Crann. It is great to have you featuring your work on Mrs Crafty B Hayley. Can we have a little fact about you? I am obsessed with detail, pencils are my favourite to create intricate hand drawings, always based around my favorite subject….Nature! The detail in this print is amazing. Tell us about a bit about it. 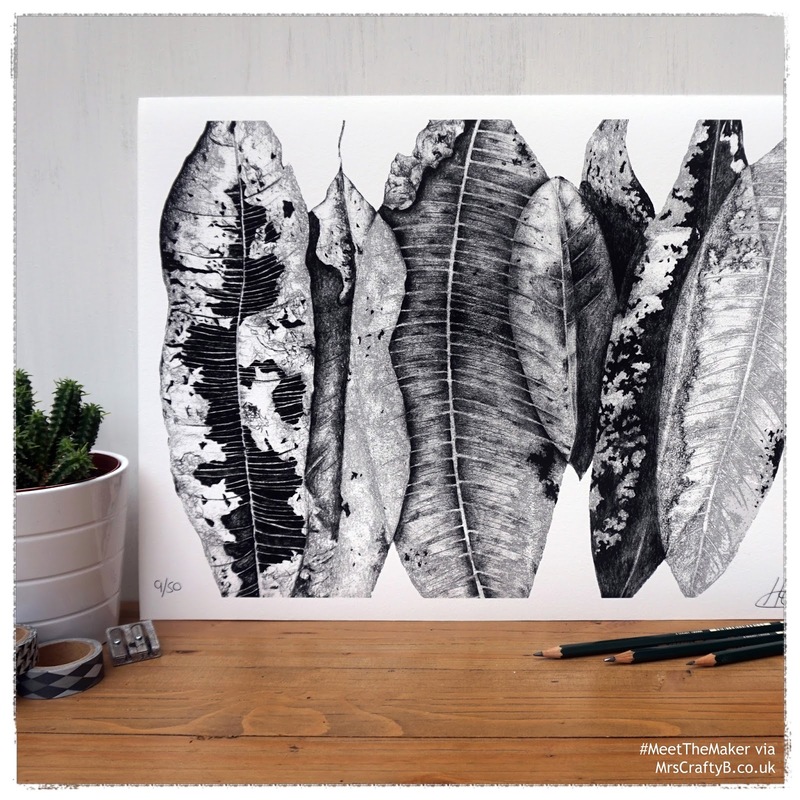 This is a Limited Edition Print ‘Leaf Decay‘. Hand drawn in pencil this design was inspired by the process of decay, looking at the way plants changed in texture and detail as they started to decompose. Absolutely fascinating and so beautifully interpreted. How did you learn to draw in such an intricate way? I have been drawing since before I can remember, it’s always been one of my favorite things do. During university I really had chance to experiment with different media but always seemed to come back to the traditional pencil. Over the past few years my skills have developed as I have become more and more obsessed with the finest of details. When was it that you decided to turn your creative skills into a business? Once I graduated I decided that if I didn’t give it a go working for myself I would always wonder if I could have ever made it work, so I decided to just do it! It’s now four years on and I haven’t looked back. Where do you take your inspiration? Yes I am on Facebook and Twitter. Great. We shall come and find you. Will this be your first at the Handmade Fair? Yes! I’m feeling a little nervous but mostly excited. That tends to be the general feeling amongst other exhibitors I have interviewed. I get the sense that it is going to be a great atmosphere. What are you most looking forward to? Meeting lots of other makers and hopefully lots of lovely shoppers. What will shoppers find at your stand then? Hopefully I will catch you in action. What will you be up to between now and The Handmade Fair? Releasing my new Sea life Collection, completing a few commissions and doing other craft shows. Good luck with the new collection. Ok, a quick fire round! Name three stands you will be visiting at The Handmade Fair? Ben Rothery Designs, The Paper Hare and The Silver Shed. Nice Shoes, Food and Cocktails. Exciting Opportunity for Designer Makers. I am so pleased to be featuring your beautiful print on our Meet The Maker special Hayley. I look forward to seeing you at the fair.